NTFS (New Technology File System), developed by Microsoft, is the most common file system. It is widely used in PC, hard drive, external hard drive, etc. If you want to recover deleted, formatted or lost data from NTFS hard drive, external hard drive, you can easily and quickly find the appropriate NTFS data recovery software to help you recover your data. You also can find easy-to-use & powerful NTFS data recovery data recovery software here. How to perform NTFS data recovery? A good NTFS data recovery software should be simple, powerful and efficient. DiskGenius is one of the best NTFS data recovery software. It combines ease of use with powerful NTFS data recovery features. With this NTFS data recovery software, you can easily and completely restore lost data from NTFS file system. It supports to recover lost data from most of NTFS devices like PC/Laptop, hard drive, external hard drive, etc. 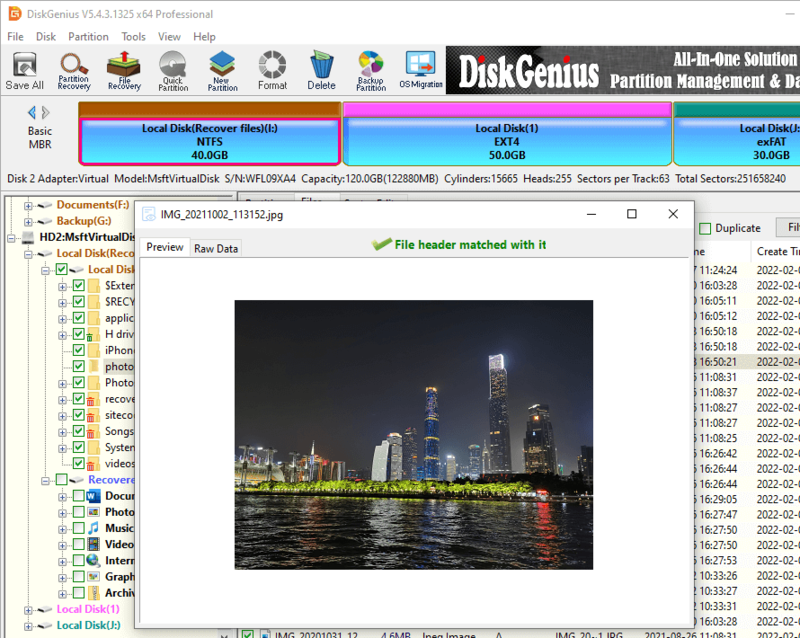 DiskGenius not only can recover deleted files from NTFS file system, but it also can recover formatted, corrupted or damaged files from this file system. It even can recover deleted or lost NTFS hard drive partition on your computer, also supports to export data from inaccessible NTFS hard drive partition. Actually, it is a comprehensive data recovery program – solve all data loss problems, recover all devices and supports for data recovery from NTFS, FAT, exFAT and other file systems. Just download this NTFS data recovery software here. Now, you have the best NTFS data recovery software – DiskGenius installed on your computer. You can start to recover lost data from any hard drive or device. But please don't put new files to your NTFS hard drive before you get all lost files back, in case that new files would overwrite the disk space of the lost files – that will narrow the chance of data recovery. The recommendation is running NTFS data recovery software immediately. If you have installed DiskGenius on your computer, just open it. It takes three simple steps to help you do NTFS data recovery. Step 1 Choose the NTFS hard drive or device. After running DiskGenius on your computer, it will list all hard drives and devices on your computer. Just choose the NTFS hard drive/device where you lose your data. Step 2 Scan the NTFS hard drive/device to find lost data. Click on "File Recovery", and "Start" to scan the selected hard drive or device to find your lost data. DiskGenius offers advanced scan technology to deeply search the NTFS hard drive/device to find all your lost data. Step 3 Preview and recover lost files after scanning. When the scan gets finished, you can preview all the lost files. Then select and recover your lost files with ease. This is the safe and easy way to recover lost data from NTFS file system. DiskGenius offers best NTFS data recovery solution. As you've seen above, it takes only three steps to recover all lost files. DiskGenius supports to recover all types of lost files such as photos, documents, videos, audio, internet files, etc.